Today I started wrapping the Christmas presents for my family. I'm not going too overboard, they are going to be shipped to Florida after all, but I love wrapping... even if I'm not always so great at it. I had a quandary while wrapping my nephew's presents, I had a small item that I didn't really have room to box up and wrap, but I didn't juts want to toss it in somewhere. 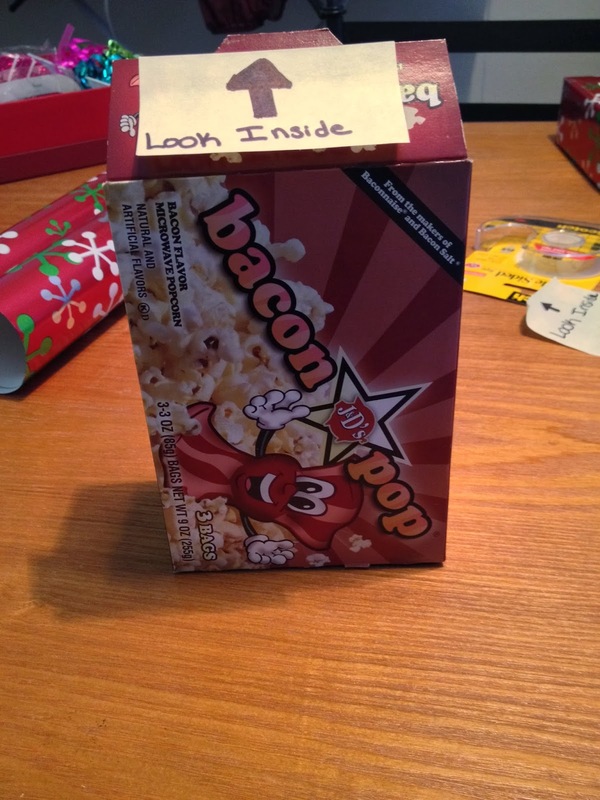 Then, his box of BaconPop was super damaged on one corner, so I replaced just the box with mine. Since it was already open, I inserted the present and left him a note :-) If you've never had BaconPop before, I highly recommend it. It's gluten free, vegan, and totally yum. Btw, today is the 18th anniversary of my family moving from Tennessee to Florida. How crazy is that?